Climate Change is considered to be one of the most serious environmental issues of this century. The United Nations Inter-government Panel on Climate Change (IPCC) has identified the build-up of atmospheric greenhouse gases (GHGs) such as carbon dioxide, methane and nitrous oxide as threatening global climate stability. By 2100 the global climate is expected to warm by between 1.8 and 6.4oC (IPCC, 2007). The impacts of climate change on natural ecosystems, biodiversity, human health and water resources are already being observed and are projected to become more pronounced (Anonymous, 2007). In their natural state peatlands act as long-term sinks for atmospheric carbon dioxide. A persistently high water table is necessary for this function. Peatlands are the most important long-term carbon store in the terrestrial biosphere. They sequester and store atmospheric carbon for thousands of years (Charman et al, 2008). The peatlands in the northern hemisphere alone store approximately 450 billion tonnes of carbon (Gorham, 1991). Undisturbed peatlands accumulate carbon from the air at a rate of up to 0.7 tonnes per hectare per year (Pearce, 1994). The Wildlife Trusts in the UK have estimated that a 2m deep peatland stores 8,000 tonnes of carbon per hectare (Paul, 2008). Blanket bogs and fens in general are likely to hold lower carbon stores than deep, intact raised bogs. In Ireland peatlands are estimated to store 1085 Mega tonnes (Mt) of carbon, this corresponds to 53% of all soil carbon stored in the island of Ireland on just 16% of the land area (Tomlinson, 2005). The delicate balance between production and decay easily causes peatlands to become carbon sources following interference. A drop in water table due to drainage, peat removal, burning and other human influences leads to significant releases in some greenhouse gases but conversely a decrease in others (e.g. methane). Between 1990 and 2000 up to 23 Mt of soil carbon has been lost, mainly due to industrial peat extraction (Tomlinson, 2005). It is vital to maintain a pristine water table on peatland habitats to prevent the large scale release of these gases. In Ireland the long-term carbon storage function of 47% of our original peatland area has been severely diminished through domestic and mechanical peat extraction. Wilson (2008) estimates that small-scale mechanisation, currently operated by turbary rights owners, could release around 2.3 tonnes of carbon per hectare from the degraded areas of peatland. This corresponds to an annual emission of 1.25 Mt carbon from peatlands in the Republic of Ireland. At such levels, it will be increasingly difficult for Ireland to reach its Kyoto targets. Because of the large emissions from degraded peatlands, rewetting and restoring them is one of the most cost-effective ways of avoiding anthropogenic greenhouse gas emissions (Charman et al, 2008). In a natural peatland system, the movement of greenhouse gases (e.g. 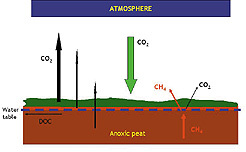 methane and carbon dioxide) between the peatland and the air is complex. Although peatlands accumulate carbon over the long term, they both fix and emit carbon dioxide and release considerable amounts of methane, a by-product of anaerobic decomposition. Drainage of a peatland upsets the accumulation process and leads to a vast increase in the amount of carbon dioxide released to the atmosphere from the peatland, a by-product of aerobic decomposition. The diagrams prepared by Wilson (2008) inset below illustrate these concepts. The Millennium Ecosystem Assessment 2005 predicted that by the end of the 21st Century, climate change would be the major cause of biodiversity loss. The predicted increase in temperature and the changes in rainfall patterns, coupled with centuries of habitat loss, are likely to have a major impact on peatland ecosystems. As peatland formation in Ireland is strongly linked to climate, any changes in the climate is going to have an adverse effect on our peatland types. A research team in Trinity College Dublin led by Mike Jones have quantified the likely impact of climate change on the three major peatland types in Ireland. Jones et al (2006) predict that within the next 50 years, climate change will cause a loss of between 30 and 40% of all peatland types. The 1990’s have been the warmest decade in the Irish instrumental record (Sweeney et al, 2006). As well as temperature changes rainfall patterns will also change, with prolonged periods of dry weather more likely to occur in the future. Analysis of the Irish meteorological monitoring network has shown that already the south and east of the country are experiencing drier summers, while the north and west are experiencing wetter winters (Sweeney et al, 2006). As a result changes are anticipated in the distribution of peatlands, with south easterly sites most at risk initially. However this may be counter-balanced by better conditions for peat accumulation further north, thanks to increased rainfall in winter. The MONARCH (Modelling Natural Resource Responses to Climate Change) programme 2001 is a long-term programme developed to assess the impact of predicted climate change on wildlife in Britain and Ireland (Harrison et al, 2001) (Walmsley et al, 2007). It points to where climate is likely to become favourable or unfavourable for species, thereby influencing their future distribution. MONARCH predicts a loss in suitable climate space in Ireland for the Skylark (Alauda arvensis) and a gain in suitable climate space for the Marsh Fritillary butterfly (Euphydryas aurinia). The dominant vegetation of most bogs is Sphagnum moss, of which there are many species. MONARCH investigated the likely future extent of Sphagnum papillosum. Its climate space is likely to remain and possibly enlarge across Ireland. A similar response is seen for other bog species such as Bog Myrtle (Myrica gale) and White-beaked sedge (Rhynchospora alba). But more northern species will probably lose a significant part of their distribution, such as Cloudberry (Rubus chamaemorus), which may find conditions too warm and could disappear entirely from Ireland. As most peatland species are extreme habitat specialists they may be unable to adapt to the rapidly changing climatic conditions that are predicted. Further research is needed on the environmental requirements of each individual species so as to determine which species are likely to be most at risk. Unfortunately, at present, relatively little is known about the vulnerability of most of our bogland plant and animal species to enable a more accurate assessment. A survey of 850 native plant species carried out by Dr. Peter Wyse Jackson of the National Botanic Gardens of Ireland showed that 171 (20%) of Ireland’s flora appears to be particularly vulnerable to climate change up to 2050. 34 of these vulnerable species occur on peatlands including Fen Violet (Viola persicifolia), Bog Orchid (Hammarbya paludosa), Cloudberry (Rubus chamaemorus) and Marsh Saxifrage (Saxifraga hirculus). In conclusion, the current management of Irish peatland resources is generally not sustainable and is having major negative impacts on climate and biodiversity. Strict protection of intact peatlands is critical for the conservation of biodiversity and to maintain their carbon storage and sequestration capacity and associated ecosystem functions. Rehabilitation and integrated management of peatlands can generate multiple benefits including maintaining biodiversity and mitigating climate change, as well as decreasing poverty and combating land degradation. Concerted action for the protection and wise use of peatlands should therefore be a national priority linking work at national, regional and local levels (Charman et al, 2008).